I never used to be much for sandwiches, until I discovered the Trifecta. 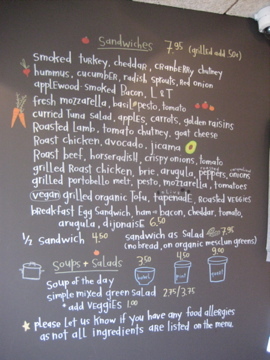 Darwin’s’ Ltd. (Harvard Square), All Star Sandwich Bar (Inman Square), and now Flour Bakery + Cafe. Flour is celebrating their own trifecta with a third location, in my neighborhood of Central Square (right next to my buddies at Central Bottle). Better known (to me at least) as a bakery than a sandwich shop, Flour has been famous for their sticky buns and their South End location for a decade, celebrating their 10 year anniversary this week. I’m not a sticky bun person myself, but I have trekked to the original Flour several times on a Sunday morning with various partners, only to be met with a big “sold out” sign. When their newest location opened near my home in Central Square, I tried again to get ahold of this treat, and in fact the header of this blog is a picture of coffee and sticky buns at Flour. The public is right, the buns are delicious, even for someone who typically thinks that type of pastry is too sweet. For me, the stickies were a one time thing to see what everyone was talking about, but I am more than happy to make my way through the rest of Flour’s sweet offerings- cookies, scones, croissants, muffins, breads, brioche, and a fantastic breakfast pizza. You’ll need a nap after eating it, but totally worth it on a lazy, decadent weekend. My favorite, however, is my now beloved vegan chocolate muffin. I’ve been raving about this for months- and I’m not vegan. 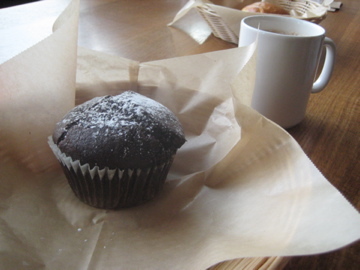 The muffin is sweet but not sickly, moist, and studded with chocolate pieces, topped with powdered sugar. During my last visit, the most bacon-centric, vegan-skeptical person I know readily admitted that this muffin is phenomenal. Now, if that doesn’t convince die-hard carnivores, nothing will. These muffins are also billed as low-fat, a characterization completely belied by their richness. I hope they really are low-fat, since I’ve been eating them with wild abandon, but all I care about is how good they taste. 1. The chicken is cut in slender but not wimpy pieces that make it easy to eat. None of this unwieldy whole chicken breast shoved into a roll foolishness. 2. The creaminess of the avocado and the crunchy jicama make for a really satisfying – and unique- mix. 3. The bread is perfect. 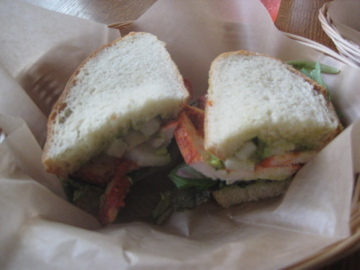 There is nothing worse than a sandwich with great filling and sub-par bread, and, of course, at Flour Bakery that is never a problem. Another great part about Flour is her owner, Joanne Chang. Also responsible for Myers + Chang, a restaurant that she opened with her husband, Joanne just seems cool. I’ve seen her walking through the kitchen at the Central Square location, and her staff is always happy to see her. In my own life, I strive to be the boss that everyone smiles at when they see coming, not the one they run from, so I can really appreciate the genuinely happy atmosphere and cheerful employees at her businesses. From following her on Twitter it’s clear that she is committed to giving back to the community (working with Lovin’ Spoonfuls etc. ), and that she is passionate and excited about what she does. And nothing makes a low-fat vegan chocolate muffin taste sweeter than a love for what you do.